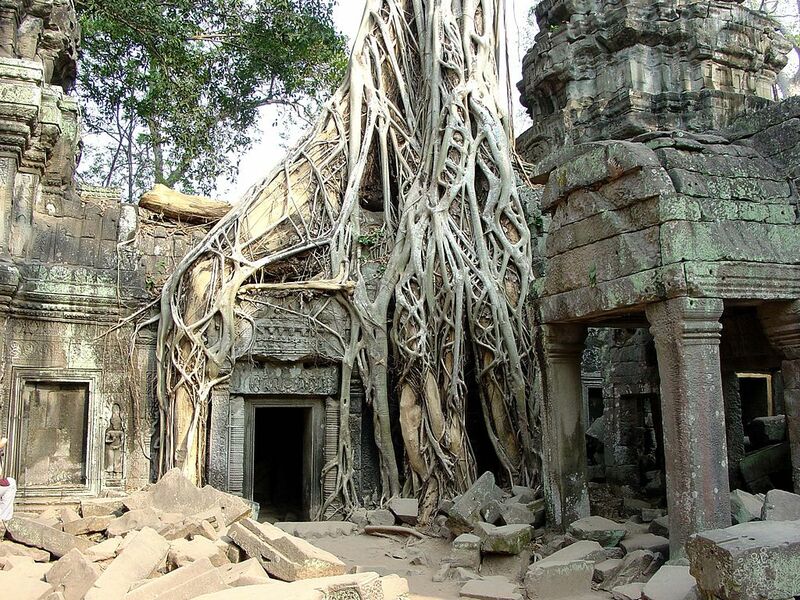 Magnificently overgrown trees hug and grasp the walls at Ta Prohm. Real-life monkeys (gibbons and langurs among them) sometimes wander by all the temples in the majestic Angkor park – including the grandest of all them all: Angkor Wat. 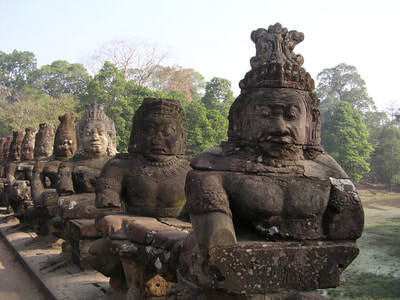 To walk through the majestic Angkor Wat temple is to begin your journey into the heart of Cambodia. 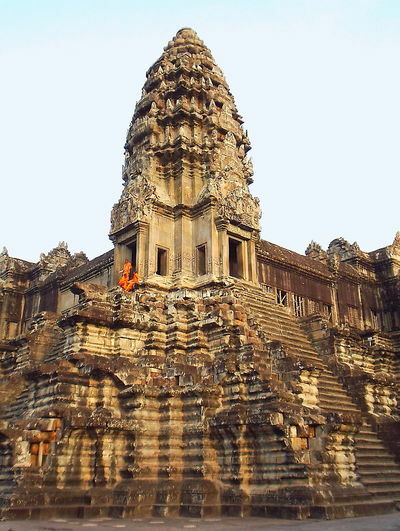 Built between 1113 and 1150, on lands populated at least since the 8th century AD, it is the largest religious monument in the world and once held the largest empire in the world (in the 12th century when it was the capital of the Khmer Empire and ruled a large part of Southeast Asia.) It is also, in essence, a trip back in time – holding the secrets of Cambodia’s history in its temple walls. The symbol of Angkor Wat is powerful here in Cambodia, and it’s remained front and center at the fabric of this country – from their money to their flags (starting with their first national flag in 1863, when Cambodia was colonialized by the French up through their independence and beyond). According to 13th century legend, the temple was supposedly constructed in a single night by a divine architect, or according to French explorer Henri Mouhot many years later, ‘an ancient Michelangelo.’ Of course, the construction of Angkor Wat and its surrounds actually began centuries earlier. Scientists and archaeologists are still making new discoveries and findings. As recently as June 2016 – 1,000 year old cities were found via lasers, deeply buried in the jungle surrounding the temple complex. Angkor Wat was originally a Hindu temple, built by Khmer King Suryavarman II in the 12th century to honor the god Vishnu (breaking with Shaiva tradition of depicting the god Shiva). It was converted into a Buddhist temple in the 14th century, and statues of Buddha were added. Roughly 700 feet high, the architectural profile of Angkor Wat is imitative of a lotus bud, with rows of graduated tiers in its many towers (a total of five, although they are only all visible for certain angles). 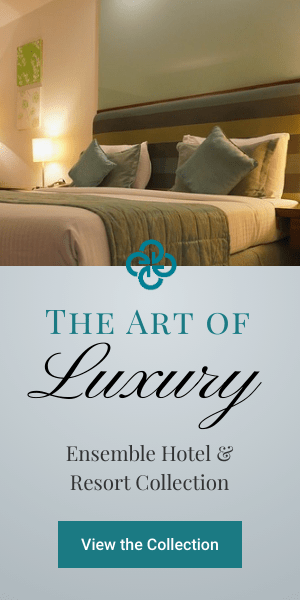 It is surrounded by a 650 foot wide moat, encompassing a perimeter of more than 3 miles. The moat is 3 feet deep and stabilized the temple’s foundation, preventing groundwater from rising both too high or too low. Guardian lions (don’t worry, they’re made of stone!) grace the entrance of the main western entrance (a direction associated with Vishnu). A more modest entrance faces eastward. There are nearly 13,000 square feet worth of exquisite sandstone bas-reliefs. American author Helen Churchill Candee once wrote that “by their beauty they first attract, by their strangeness they hold attention.” So, too, for the palace of Angkor Wat.